It looks like the Chicago Cubs are serious about ending this World Series drought thing. The team's loaded with top-tier prospects including a power-hitting catcher taken fourth in the 2014 draft who is already tasting the majors. 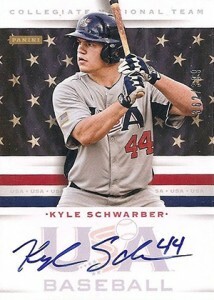 While Kyle Schwarber rookie cards are still a few months away, he does have several important cards to hold collectors over. Shop for early Kyle Schwarber cards on eBay. 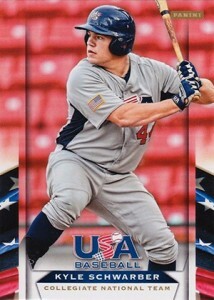 Kyle Schwarber cards first came out while he was playing for the national team. Panini included base and autograph cards in their annual box set. The floodgates opened somewhat in 2014 following the draft. He's one of the key players in 2014 Bowman Draft Baseball. The following is a list of some of the key Kyle Schwarber cards released prior to his MLB debut at all price points. It's not a complete list of all of his cards. Many of these have several parallels as well. 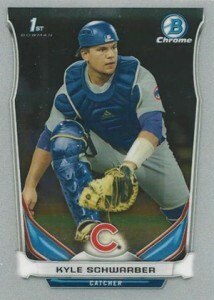 Although this is the first licensed Kyle Schwarber card, it's not overly expensive. A lot of collectors overlook USA Baseball products despite often coming out well in advance of their first cards as a pro. Included as part of a box set, singles aren't always the easiest to find. 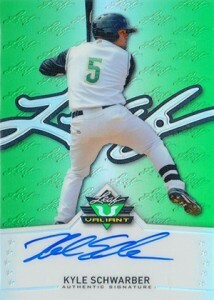 Panini has included lots of autographs and memorabilia in their USA Baseball sets. 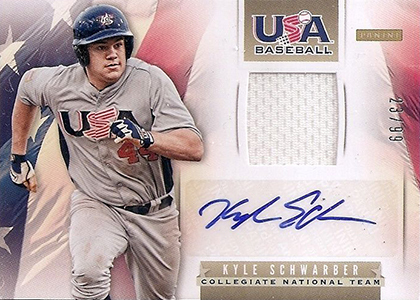 2013 Panini USA Baseball includes an autographed jersey card that's numbered to 99. Like the base card, it's hard to find. Already scarce, not all sets get opened or split up for the secondary market. Although much more plentiful than the signed memorabilia card from the same set, this autograph comes with an on-card signature. For some, this might make it more desirable. As far as autographs go, it's very reasonably priced when compared to Schwarber's 2014 Bowman Chrome Draft autograph. Not everyone can afford the signed version. 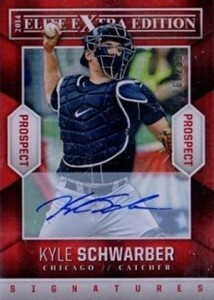 That's where the regular 2014 Bowman Chrome Draft Kyle Schwarber comes in. It's very affordable and features the first round pick on an MLB card. In addition to several Refractors, there are both the regular Bowman and Bowman Chrome Mini versions. However, the main Chrome brand carries the most clout for the low price point. A player's first Bowman Chrome Autograph has become the go-to card. This isn't a rookie card by definition, but it's treated by many as one. 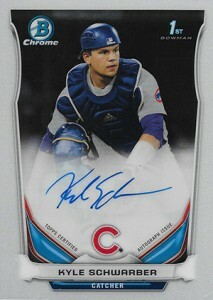 With big demand, the card isn't cheap when put alongside other early Kyle Schwarber cards. That goes even higher when you get into the serial-numbered Refractors. 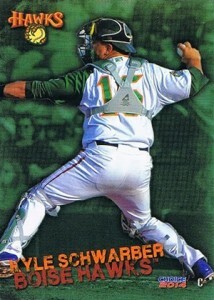 As time goes by, this should be Schwarber's most important card. This card is tough. 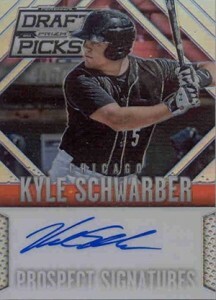 Take a look for 2014 Bowman Sterling Kyle Schwarber cards on eBay, COMC or any other site or dealer with a large selection and you're likely to find noticeably more autographs than the base Prospect insert. Sterling doesn't have the prestige that Bowman Chrome does, but if you're looking for a basic card, this isn't a bad choice. 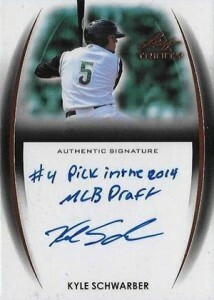 This card is a more affordable alternative to the Bowman Chrome Draft Autograph. Sterling is a lot less popular on the secondary market on a good day. Then there's the sticker autograph here that compounds it. However, if an early MLB autograph is your goal, this might be the way to go. 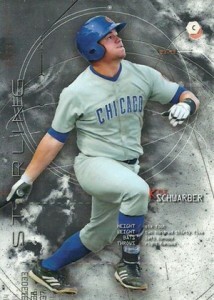 This is a traditional minor league card of Kyle Schwarber. Issued by the Boise Hawks, a single-A short season team, it's difficult to find. It might not have the MLB's blessings, but for collectors, it means a cheaper price. 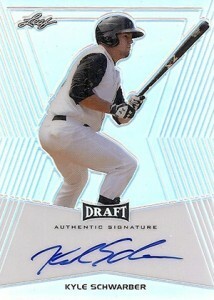 Like Bowman Chrome, the 2014 Leaf Metal Kyle Schwarber has an on-card signature. With the name Trinity, it shouldn't be a surprise that there are three different Kyle Schwarber cards in the product. The first is an inscribed autograph that comes with a signature and a short note. Autographed Patch cards have a large piece of a player-worn jerssey that looks good even without any game use. And then there's Pure, a signed card that's done on plexiglass-like stock. If you're going the singles route, it's a pick-your-poison opportunity based on what you prefer. For 2014 Valiant, Leaf changed the look up a bit. The regal tribute to Donruss Crusades inserts is gone. But the colorful backgrounds, shine and on-card signatures remain. 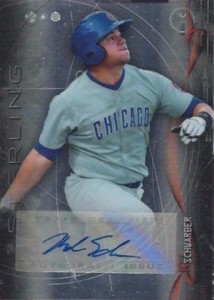 Like other Schwarber cards from Leaf, the more reasonable price tag is the appeal. 2014 Panini Elite Extra Edition might not have an MLB license, but it's still a prospecting brand with a good amount of history. It has a hard-signed autograph and, unlike Bowman Chrome, it's serial numbered. But that lack of logos cuts into the value. There's no denying that Prizm is Panini's take on Bowman Chrome and other chromium brands. Part of the sophomore Prizm Perennial Draft release, the base Refractor-like Kyle Schwarber autograph is actually pretty difficult to find. In fact, some of his serial numbered parallels pop up more often. Like Elite Extra Edition and Leaf's sets, this is a Bowman Chrome alternative and sells accordingly. 2016 Topps Update Walmart Exclusive Rookies #W-19 Kyle Schwarber Rookie Card! 2016 Topps Heritage Chrome Refractor THC-161 Kyle Schwarber Carl Edwards Jr C.J.